I had started to make it a comment, but it got a bit big for that. I get to use my shiny new MySQL database to look at some of the things related to this problem. For starters, let’s ask just what stations are south of -45 degrees. That is, what are the reporting stations in the south 1/2 of the Southern Hemisphere. First up, how many are there? All of 39 stations. I happen to know from prior investigations that many of them have very short records. Antarctic stations that were only staffed for a few years or decades. The GHCN ship locations have spotty reporting and are up north. But let’s move back out to the 1/4 of the globe, 1/2 of the hemisphere, point again. That’s a total of 66 over the entire length of the record. For about 1/4 of the planet. But then you must also allow for the fact that many of these are short lived or have sporadic reporting. The SHIPS records especially, are only reported when a ship was in the area and bothered to take a temperature. Each ship with a different instrument of unknown calibration. So what are these stations? Let’s report them, then inspect the “country” field to see where they are. Note that the 1 in the first digit is Africa, so the first 4 in the report are “Africa”, but 2 of them are islands. That’s right, all of 4 stations cover that large arc of area around Africa in the bottom 1/4 of the globe. (roughly as marked by the green line of the Southern Ocean boundary on the image above). So the data are already very limited even before we start asking “How long and how full is the record?” for each station. Note too that nothing shows for the expanse of the Pacific where it reaches the Southern Ocean. All those “South Pacific Islands” are up where it is warm and nearer the tropics. We then get a decent block of Patagonia. 13 Argentine stations. 6 from Chile, though at least one of them is really in Antarctica, and a couple of islands owned by the UK. After that, it’s a list of Antarctic stations with variable staffing durations. Remember that it was very difficult to keep an Antarctic base fully staffed and operational over the winter in the early 1900s. New Zealand shows up with 4. UPDATE (for Billinoz): Yes, and even one from Australia on McQuarie Island. When you make it the bottom 1/3 of the hemisphere it is basically Antarctica. One island, a couple of “Bases” assigned to Chile and Argentina, but in Antarctica, and then other stations in the deep freeze. Opened in 1947. So for this base, all history starts after World War II. Now for a lot of folks that will seem like ancient history; but in terms of climate it is just yesterday. That’s a pretty short record, especially when you consider there are known cyclical changes of about 60 years and 1500 years. You will not be sampling a steady state flat condition, but a small part of a cycle. Then we note that it is the oldest Chilean base. Any other of their bases will have even less data. If it is starting to sound “spotty”, you are right. So there is a total of 31 stations in Chile, and this one is 89057 (or 30489057 with country code attached). But just what data made it from the station into the GHCN? Does it start in 1947? Um, no. This is GHCN v3.3, the latest before the new revision to GHCN v4 (that I could not download due to the government shutdown when building the database). It starts this station in 1966. I’ve chopped out some of the report below, to highlight the missing data flagged by -99.99 in some years. Note that this is not all the data that is missing. There is a pattern where the Dec – Feb data seem most prone to being missed. Changing station staff in Summer? I’ve not flagged all of them. Then it ends in 2015 with another string of missing data. South America has had a few financial / political eruptions over the years, and has had trouble funding everything their government, and people, want funded. I’d also note the non-trivial problem that most Antarctic bases have grown in size and in fuel burned over the decades. It doesn’t take much to warm the area around a small town when you are worried about 1/10 C variation. Now here’s the $Billion Dollar Question: That 1940s data has July and August temps in the -11 to -12 C range. More recent records show -7 -8 or -9 range. Is that 3 to 4 C (roughly) drop due to a normal cycle of the Polar See-saw? Due to growth of the station and siting issues? Due to a natural 60 years cycle? Due to a change in the Southern Ocean currents under lunar tidal changes (known to have major cycles over an 1800 year span and with 60 year cycles as well)? Due to changes in volcanic activity on the peninsula? (When it is known that the volcanoes are now a bit active under the ice). Did it in fact have a cold spike and reach the prior history in 2010 or 2015, but that was when the data has a dropout? How do you attribute causality with that short and sparse a data set? When you go through the other stations, you find very similar things. In the far south, most start late in history, have sporadic data drop outs, and various issues with data quality and availability. Realize you can not fix this. The history is done and set. We can’t go back and open the station earlier, nor send someone to gather the 2010 data nor fill in August 2015. That’s pretty slim pickings in the Southern Hemisphere for any actual data. Now remember that a few times I’ve talked about “SHIP data”. There are some data collected from places in the ocean where, were a ship passing by, it could take a measurement. So how much SHIP data is in the Southern Hemisphere? Oh… that would be “none”. All that water is the Big Empty, per GHCN version 3. This entry was posted in AGW Science and Background, NCDC - GHCN Issues and tagged Antarctic, GHCN, Hemisphere, Southern. Bookmark the permalink. @EM: At the bottom of one of your SELECTS: 10.54 sec. For a sequential search of a large data set, not bad at all. I’ve bolded it below. It has 816 months of data, or about 68 years. Nice, but still a bit short for climate trend detection. Still, longer than a lot of the other Australian stations. Take the third one at 156 months of data. That’s 13 years. Not even enough for a full 22 year solar cycle. Way short of the 56-60 year lunar tidal cycle. Yeah! I’m really impressed by the Odroid XU4 and the disk is a USB 3.0 so all in all rather fast. FWIW, Chile only had something like 73 stations in the same kind of report IIRC. @EM: ‘…sequentially ordered file…’ I reply: For ad-hoc sequencing, a pipe to ‘sort’ is your friend, but ‘ORDER BY’ is also useful. Sort has the benefit of running as a separate task, where ORDER BY has to be done in the SQL Server task. But you already knew all of that. Working with such data must produce one heck of a headache. In the sense of distance along the surface, this Pole to -45°S is fine. However, in terms of surface area of Earth, you are working with between 16% to 19%, I think. I could work it out in other ways, but it doesn’t seem you need it. I could search more, or work it out, but at the moment I have to go do something else. Yes “I know that” or “I don’t need that” is fine, but do realize for every person who comments here about 1000 do not; and some of them can in fact use the clue. 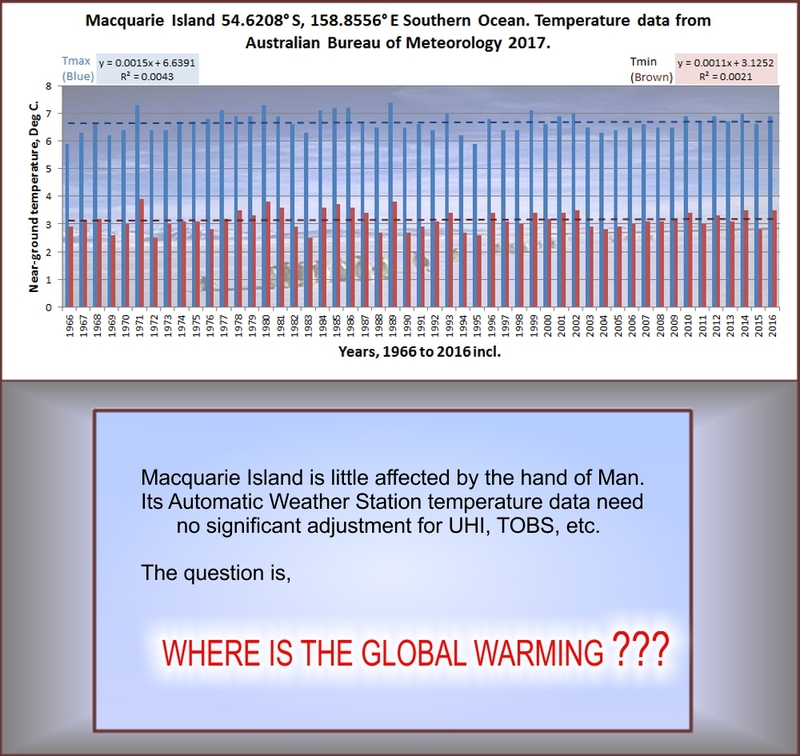 Chiefio here is a chart of MacQuarie Island temperatures..Done by Geoff Sherrington in Sydney. I do enjoy looking at the McMurdo (and other (South Pole and Palmer Station ) webcams linked from here. Temp has only been above zero 3 or 4 times this season. You can see the ship delivering the annual supplies at the moment. The sea ice did not “break” until the Coast guard ice breaker opened a channel. This seems to accelerate reduction in sea ice?! I’ve always been peeved at the folks bleating about Arctic ice breakup “early” yet never mentioning the huge increase in ice breaker size and traffic… At several feet thick, we chop it off from the grounding land attachment. Then it can float off to warmer places to melt. People also forget that by floating off and melting someplace else it cools surface waters in those areas. I suspect that a few years ago when the arctic puked a bunch of ice out past greenland that that might have been part of the onset activities to generate recent cooling trends. I wonder if every 60-80 years when the cycle shifts it is preceded by a large ice dump from the arctic? I have read several papers on sea ice export (Fram Strait most recently) and Arctic Cyclones. I would certainly imagine ice breakers played a role. Not much mention about that in many of those papers. The Russian’s IIRC have a much newer and better fleet.